Well, blast me into atoms and call me Barin, it’s a double whammy of prime-time, eyes glued to the page, engage brain and we’ll see you after it’s all over Guardians goodness. 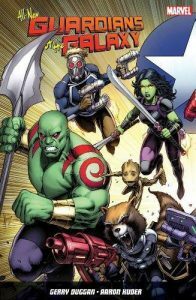 That’s right folks, Peter Quill and his erstwhile space ravaging, planet saving crew are back in action and this time, they’re delivering twice the excitement and fun. While the fate of the universe doesn’t depend on you becoming acquainted with Communication Breakdown and Riders in the Sky, if you want to keep up to light-speed with the Guardians, you’re going to need to immerse yourself in both books as the pair are inextricably linked. And you wouldn’t want to suffer a cranial confusion overload because you can’t quite figure how plot thread A links to thread D because you only bought one book and threads B and C are in the other volume, would you?. That’s the sort of mistake that leads to the kind of catastrophic meltdown in which Sainsbury’s somehow becomes an advance base for an alien spearhead invasion, bananas are mistaken for rayguns and shopping trolleys assume the form of single-pilot fast attack fighters. Which is a scenario best avoided as it doesn’t end well for anyone involved. So take it as written, that if you’re going to read Riders in the Sky, then you also need to read Communication Breakdown. With that, let’s move swiftly on to the business at hand. 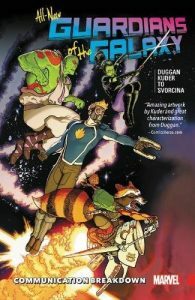 The first book, and it’s only assuming that position because it begins with issue one of the All-New Guardians series, Communication Breakdown see’s our ragtag bunch of loveable cosmic scamps and scallywags plotting their final job as a team, which just happens to be biggest heist that they’ve ever dared to dream of, one that’s supposed to set them all up for life and their lives as far away as possible from each other. Like all Guardians gigs though, it doesn’t go exactly as planned and ends with them becoming hopelessly entangled in the affairs of the Elders of the Universe and setting off to find the infinity stones in an attempt to discover just who* has altered reality and why. Faster than the Falcon on the Kessel Run, it’s a story that plunges the Guardians into the deep end of shark infested celestial waters without life-jackets and encourages them to learn how to swim with their arms tied or die trying. Which means, as you’ve probably already guessed, that it’s pretty darn awesome. However, awesome as it is, it isn’t without its faults as it doesn’t really explain how each of the Guardians have reached the points in their lives that have prompted them to undertake this last journey together and why their fragile and often troubled relationships are about to disintegrate completely. Or why Drax has foresworn violence, Groot won’t grow and why Gamora is obsessed with the soul stone. And that’s where Riders in the Sky comes in, as through its collection of one shots that focus on the individual team members, all of the blanks left in the wake of Communication Breakdown are filled in and thoroughly explained. Oh and it also probes and contemplates the power and eternal appeal of music and the once bitten, forever smitten devotion to physical media and carrier formats that plagues music fans the world over through Quill’s story in which he sets off in pursuit of a lost song. And it also sees the beginning the Guardians quest to find the aforementioned infinity stones. It’s a storming, page turner in its own right, but when teamed with Communication Breakdown, becomes indispensable. *One of the more famous mischevious Marvel miscreants. But sssshh, it’s a secret as the Guardians don’t know who the big bad is. Yet. ** Although, of course, Samnee and Reis take joint first prize, because…Well because they’re Reis and Samnee. I said it was nearly impossible, not absolutely or totally impossible.